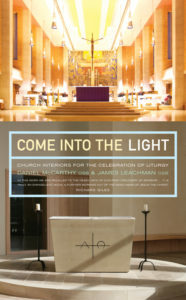 The volume Come Into the Light: Church interiors for the celebration of liturgy considers the ritual experiences of liturgy and how these experiences are interpreted by the artistic narrative of a church and how these are supported by the architectural design of a church. The volume comprises 22 articles published by Fr James Leachman OSB and Fr Daniel McCarthy OSB in The Tablet of London. Purchase it from the publisher: Canterbury Press link here.